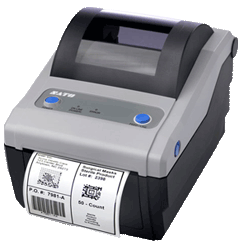 Affordable and compact, the CG2 is ideal for point of sale receipt printing. The CG Series printers' small footprint and reliable performance renders it perfect for retailers who want a low cost, yet hard-working printing solution. Label formats can be stored and variable data entered into our Keypad for a standalone option. The CG Series printers' superior performance and affordable price makes this solution perfect for stores that want a simple and low cost printing solution. With superior performance and affordable price, these 4", 203 or 305 dpi, Direct Thermal/Thermal printers are best in their class. The SATO CG Series models are delivered stock out of the box with competitive emulations onboard, optimal interfaces (built in USB standard) for outstanding performance in clinical and processing environments.